My mother was born on February 9, 1917, in Lafferty, Ohio, a small coal-mining town (yes, my mom was a coal-miner's daughter!) just west of Wheeling, West Virginia, the next-to-last child of Simone D'Ambra and his wife Anna Maria Mattera. 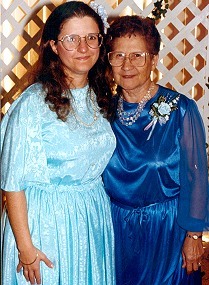 Mom had one other sister, nine years older than her, and four brothers. She was christened "Assunta," but most of her life had people call her Mary because the usual nickname for Assunta is "Suzie," a name she hated. Her parents were both from the island of Ischia off the coast of Naples, children of tenant farmers, and had been childhood sweethearts. My grandfather had the proverbial "evil stepmother" who fed her own children the best of the food and left him with the scraps, and let him go around with ragged clothes. As he walked to the fields each morning at the age of nine, my grandfather would stop by my grandmother's house. Also nine, Grandma was already a capable housewife and would cook and feed him breakfast while she did any mending of his clothing. Later they married and emigrated to America when their first child, Thomas, was still a baby. Although my grandfather and then my uncle washed, both in summer and in the dead of winter, in an outdoor shed before they came into the house, my grandmother developed black lung disease, so my grandfather took a job in Providence, RI, and moved the family to that city in 1924, when my mother was seven. Lafferty was a typical small country town where kids could run around and have fun, and neither Mom nor her older brother Nick wanted to move to the city, so the night before they were to take the train they ate quantities of green grapes, hoping to become so sick that they didn't have to move. Alas, Grandma just dosed them with castor oil and they left after all. So Mom spent her formative years on Federal Hill, the Italian section of Providence, on one story of triple deckers on both Carpenter Street and Belknap Street. Like me she was quite the animal lover. All through her childhood she had cats and small dogs--all the dogs named Brownie, the cats named Beauty (the lone tomcat was named Beau). They were all friends with each other, but one of the Brownies and one of the Beauties became very close. Some fiend poisoned Beauty, and the cat crawled home to die at the side of her pal, Brownie the dog. He howled for hours, then grew disconsolate and refused to eat. Mom said she came home one day and found him gone; her parents told her they had sent him to a relative's farm where they told her he would be happy. But she always suspected that they actually had poor Brownie put to sleep since he was unconsolable after the cat's death. For a time she had a pet pigeon, but it dirtied the fire escape so badly that the neighbors complained. She came home one day to find out an uncle had killed and then eaten the pigeon for lunch! Mom planned to go to business college to become a bookkeeper, but she had to stay home from school through most of eleventh grade to take care of her mother, who had become sick from "coal dust lungs." When she went back most of the teachers were not willing to help her catch up, and she would have had to repeat eleventh grade. She refused and went to work instead. She first worked at Coro, one of the "big two" jewelry producers in Rhode Island at that time, and then moved to the more popular Trifari, where she worked in the gluing-in department, adding rhinestones and other colored stones to bracelets, earrings, etc. It was there she met my father, who worked as a polisher. 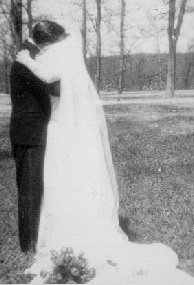 They were married May 10, 1947, and moved to their own home in Cranston in 1951. They planned to have a big family, but I was the lone child. Mom and I were always close. Actually, the three of us were like buddies and I could never understand why the kids at school complained so much about their parents. Sure, there were times I didn't want to do what I asked, and Dad and I were so much alike we got on each other's nerves, but mostly we had a great time together: on Sundays Dad drove us to the beach or to Newport or to Diamond Hill--several times a year we went to visit his sister and his brother in Massachusetts--and Mom would make great picnic lunches. Once Mom went back to work part-time we had extra money to go on vacation and we went to fun places like Lake George Village or, equally as much fun, historical places like Quebec City and Williamsburg, VA. Once a month she and I would go downtown and skip from bookstore to department store. She even took me to my first two science fiction conventions--and had a great time herself. For a while Mom did "homework" for her nephew Skippy. Her companion during the day doing this beadwork was our budgie, Frisky, and her hilarious stories about his playing with the beads were always amusing. Frisky would patter over to one of the jar lids in which she kept the little gold and silver "separator" beads, grab one in his beak, and move to drop the bead over the side of her work table. With one delighted, beady black eye, he would watch the bead drop, chirp excitedly, and go get another. Mom would get little done as she laughed and watched the excited little bird. Mom was always independent, so after Dad passed away she finally learned to drive so she wouldn't have to depend on the relatives. She'd tried to learn years before but the clutch stymied her as much in the 1940s as it did me in the 1980s. She got sick of my Dad yelling at her--he was truly afraid she was going to ruin the car transmission and we had no money for another one--and asked my godfather to teach her. Even he was driven to the limits of patience, so Mom never learned to drive back then, even though she had a license. She also joined AARP after retirment and went on trips to Foxwoods Casino and Atlantic City both alone and with my cousins. In 1998 she developed angiosarcoma of the scalp and had to have radiation treatments. The doctor told me that she had six months to live. But Mom was stubborn. She lived seven more years, enduring surgeries to remove nasty lesions from her head. When she lost her hair, she wore wigs and cute little hats. She continued to do most of her own shopping and errands, although her driving became increasingly erratic in her last year and then my cousins were nice enough to take her to the doctor and shopping if she needed it. In the fall of 2004, however, the cancer returned and at 87, she was less able to fight it. The radiation made her eating uncomfortable. Finally in May of 2005 she could no longer take care of herself. I went to take care of her, then took her home with me for a "visit." She died at our home in July 2005. 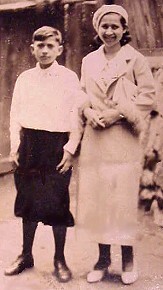 This was the earliest picture Mom had of herself, taken in 1931. It was the day of my Uncle Sammy's confirmation. He is twelve and she is fourteen. 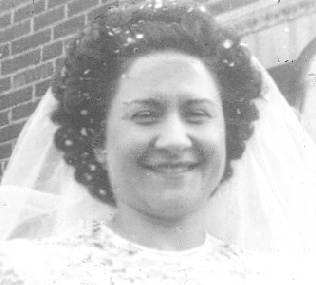 Mom on her wedding day. She and Dad were married at Our Lady of Mt. Carmel Church in Providence, RI. 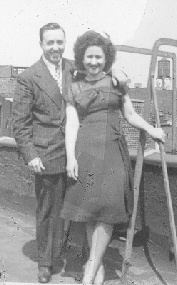 Mom and Dad on their honeymoon at a friend's house in Brooklyn, NY. 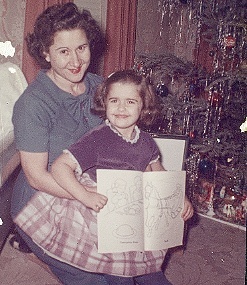 This is Mom and I, Christmas of 1961. Mom and I again, this time on my wedding day. Mom's favorite music was always from the 1930s and 1940s, and her favorite singers were Bing Crosby and Perry Como, but before they both started their careers she liked a "crooner" named Russ Columbo.